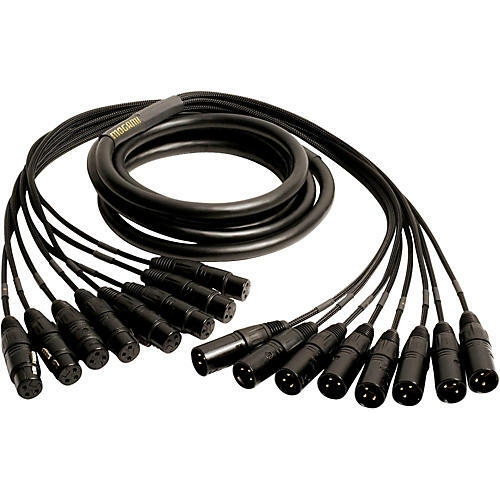 Mogami Gold multicore cables are designed for the highest level of audio performance and feature superb electrical and mechanical characteristics while remaining compact, superflexible and easy to use. Rugged and flexible construction that is easy to handle, even at temperatures down to -20 deg C (-4 deg F). Outer jackets of each pair are color coded by standard resistor color code, allowing quick identification of conductor pairs. Inner conductors are also color coded based on the international standard resistor color code. Each pair is color coded by jacket and conductor color combination. Each channel has a drain wire and served (spiral) bare copper shield. The drain wires simplify termination and can be crimped by the same size contact as the inner conductor pair. Electromagnetic Noise at 10kHz*: (Inductance of the toroidal core:  595H): 0.1mV Max. (Inductance of the toroidal core:  595H): 0.1mV Max.